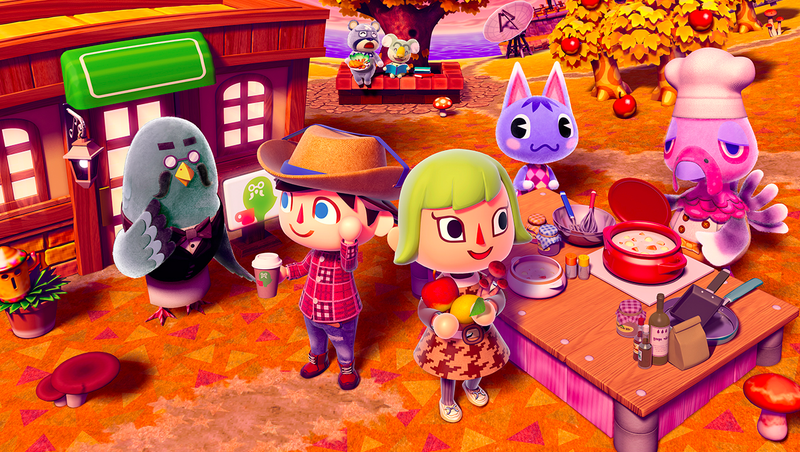 Few games are as relaxing and enjoyable as Animal Crossing—that much hasn't changed with the newest iteration. Now that the latest game in the franchise is out, I figured I'd share some tips in the hopes that they'll help you make the most of your New Leaf experience. Animal Crossing happens in real time. If your 3DS is set to December 16th, 3PM, that is the exact date and time in the game world, too. Much of the game hinges on date, time and season, so it's crucial that you start out having that stuff set up on your 3DS. Once you get going, you might even be tempted to change the date and time so that you can get to new content quicker. Some shops are only open at specific hours; some fish and insects only appear in certain seasons; some special visitors only appear on certain dates. Do not tinker with the date and time to speed up seeing all that stuff. Taking it slow is a key part of the Animal Crossing experience. You'll ruin everything if you change that. If you have a busy schedule and can only play Animal Crossing at night, sticking to real time might be a drag. In this case, you might want to set a "town ordinance" so that the shops are open later and villagers stay awake longer. It still won't become a game you can play into the wee hours of the night, though—it's just not that type of game. 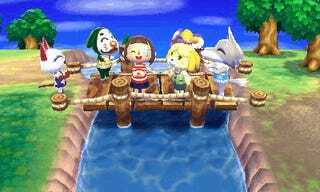 You might be tempted to binge on Animal Crossing—to spend hours grinding for bells specifically—but personally I think it's best if you pace it out. Ideally you're playing the game year-round: why would you risk burning out? Much of Animal Crossing is about expressing yourself. You build a nice house, you set up a awesome town with all sorts of amenities and sure, that's neat—but don't you want to show it off? You should! Everyone tends to have a very different town that's worth exploring. That, and, every town starts with one specific type of fruit (mine was cherries)—but the shops will give you extra money for out-of-town fruit. Additionally, since the stuff in shops is randomized, if you visit friends you'll have more stuff available for purchase. Finally, I've noted that friends who play on the same cartridge can make more headway on projects that require lots of funding—once someone gets tired or runs out of things to do, someone else can pick the game up and contribute their efforts. If I could, I'd be playing with multiple people on the same game. Alas! Unless you dislike a character and wish they would move away, you should try talking to all your townsfolk every day. They're one of the best parts of the game! Not only that, but sometimes they'll give you quests or ask you to do things with them, like play hide and seek. Don't get too caught up trying to build the perfect home or amassing bells that you forget about your townsfolk! Oh, and here's another related tip: the people you can be friends with aren't all townsfolk. Really, just...talk to everyone you can. But not too much because then they'll get upset at you. You never know where those pesky fossils and weeds are hiding—they could be anywhere. Not only that, when special characters visit your town without warning, they'll often wander about. I've also found items that townsfolk have lost in random parts of town. If you don't explore your town regularly, you might miss this stuff. Not all rocks are made equal, but you won't know until you bang them with a shovel. Every day, one rock will contain a precious stone (like an emerald) and one will contain thousands of bells. The latter rock, you'll have to hit multiple times until you get the "one up" sound from Mario—that's when you know you've gotten all the money. Every time you hit the money rocks, however, your character will be pushed back a tiny bit. You only have a few seconds after the initial hit to continue hitting the rock for more bells, and if you miss that window, the rock won't give you all the money. You could either try to shuffle your character forward after every hit, which might be tricky, or you can dig out holes behind you so that it's impossible for your character to be pushed back. Your choice. Finally, some trees hold stuff like bells and furniture (???) in them. Shake them and see what you find. You technically only have 16 inventory slots, but you also carry around letters. Letters can hold presents, and these presents can be pretty much anything you can carry. Feel free to put stuff on your letter slots as "presents"—I like to use letter presents for stuff I don't use often, but still need on the field on occasion. Right now that means a change of clothes, a megaphone, and a slingshot. Expanding your house and funding the development of a town is expensive, let me tell you. If you're serious about putting a dent into your debts, I'd suggest regularly visiting the tropical island available to you about a week or two into New Leaf. The island seems to spawn fish and insects with more regularity than your town does, and is home to a variety of exotic creatures. As you might've guessed, exotic stuff rakes in bells. But don't think that means you can write your town off. I go fishing and bug hunting in town, as it features stuff the island doesn't have. New Leaf has a museum. A bare museum, which isn't very useful. Well, it's bare until you put stuff in it. While you might be tempted to sell your stuff for bells, I highly suggest donating everything you can immediately. You'll get donations out of the way quickly, and you'll never have to worry about it again. At the very least, consider donating the extra rare stuff you find (you'll know it's rare because your character will say something in huge text—like OMIGOSH). It might sell for a good number of bells, but you can never be sure you're going to catch more than, say, one Coelacanth per game. Might as well donate it! If you're the mayor, then that means you're responsible for the citizens of your town. While you can play Animal Crossing any way you'd like to, it's good to take into account what the townsfolk would like to see in your town. If nothing else, taking the citizens into account gives you more stuff to do in the game—stuff that you might've never considered before (I, for instance, didn't care about gardening until citizens demanded I beautify the town. Related tip: you can grow flowers with special colors if you plant different-colored plants next to each other). Most of the shops start as small, humble endeavors that don't carry much stock, and what they do carry is limited. That can change, provided you spend enough bells. Once you spend enough bells, stores might shut down for a day so that they can expand. Eventually you may have more kinds of venues to visit in New Leaf, like a club, coffee shop or shoe store. So don't be stingy! If storage becomes a problem after you make a habit of shopping till you drop, remember that you can use the locker at the train station, if not purchase furniture that can house items. There's an association in-game that rates your house. They take into consideration if you have full sets of furniture, amongst other things that you can find out about if you talk to Lyle at Nook's Homes. If you want to please the association, go nuts. They'll give you items. But personally, I think it's more important to make the home you love—which might not align at all with what the association considers a good home. You may want to take Feng Shui into consideration when placing stuff in your house, though. Typically Animal Crossing games will reward you with rarer fish, bugs and items if your house has high amounts of Feng Shui. Here's a primer, as it relates to Animal Crossing. And remember: your house doesn't even have to look like a house at all. People make all sorts of crazy things in their home. Think creatively. As I mentioned in my review, if you run in this game, you'll scare the bugs and fish off. You'll also kill flowers. Like I said, Animal Crossing is a game you'll want to take it slow with. Don't run. You'll also want to walk in real life, too. All the fan-servicey items are attained through fortune cookies, and fortune cookies are purchased via the 3DS's play coins—which you get by walking with your 3DS. The more you walk, the more fortune cookies you can afford. When I say "fan service" I mean stuff like Link's clothes or a ? block. So in the interest of your health and special Animal Crossing items, you should definitely walk with your 3DS. Your face is determined by the questions you answer at the start of the game; here's a guide on that. If you don't have a slingshot yet, you can pop the balloons on floating presents with your net if the present drops in elevation enough—which happens when it floats over the cliffs by your beach. Just because a fish is small doesn't mean it's not worth much. Fish in the tiny ponds around town, not just the sea and rivers. If you hear buzzing, it's likely an underground bug—get digging. Shooting stars can give you presents. Ask the post office about special gifts. You can put up to 9 fruit into one bunch in your inventory—just drag them into the same slot, creating a "fruit basket." Save before quitting your game. FINALLY, HERE ARE A BILLION QR CODES, good for making your town look like it has roads + bunch of other neat stuff. Talk to the Able sisters to use QR codes. And here's one more, made by Nintendo, for us. Whew. To be honest, this stuff is just scratching the surface—there's so much in this game. Still, those are our tips for Animal Crossing: New Leaf. Now get out there and make an awesome town. Images via @auntiepixelante and @daphaknee.